The GX2472 is a high performance, dual differential channel, 14-bit digitizer offering high dynamic range and excellent SFDR. The module's differential inputs, coupled with its low distortion makes it an ideal instrument for analyzing high performance or low level analog signals. Each channel offers 3 selectable low pass filters, a 14 bit, 70 MS/s ADC, and 512 KB of memory. A 50 MHz or 70 MHz clock with a divider provides a common acquisition clock source for both channels. The GX2472 provides two, differential inputs offering the ability to make low level measurements in the presence of common mode or noisy signals. The inputs can also be configured for single-ended operation. The input impedance is selectable for 10 K ohm or 50 ohm. The 50 ohm configuration supports AC or DC coupling. Each channel can also add an offset to the input signal, providing the ability to maximize the A to D's dynamic range. Both channels offer three, 3-pole, low pass, butterworth filters providing the ability to band limit signal noise and minimize aliasing effects. The filters can also be bypassed to take advantage of the input amplifier's full bandwidth. Clocking of the digitizer is provided by a 10 MHz, 50 MHz or 70 MHz clock which can be divided by 1 to 256. 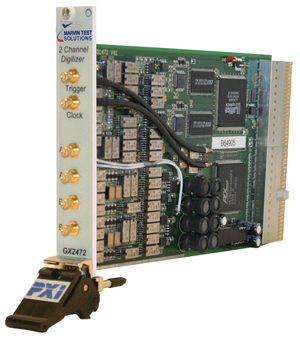 Each channel can be independently triggered to start a measurement from an external or internal source. The board is supplied with a 32-bit DLL driver. Various interface files provide access to the DLL from programming tools and languages such as ATEasy, LabVIEW, C/C++, Microsoft Visual Basic®, Delphi, and more. The available virtual panel can be used to interactively adjust and control the instrument from a window that displays the instrument's current settings and measurements. An On-Line help file and PDF User's Guide provides documentation that includes instructions for installing, using and programming the board.